Don Giovanni comes from the autumn of 1959. 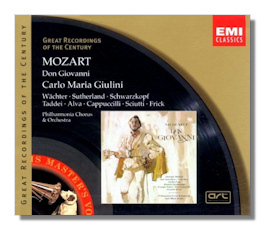 Otto Klemperer was slated to conduct this recording (and Sir Thomas Beecham had been strongly considered), but three days into the sessions, he fell ill. Producer Walter Legge lost no time in securing Carlo Maria Giulini, who already had led EMI's Marriage of Figaro. Giulini was an excellent choice (although I think I would have liked Beecham or Klemperer even better). He was a "singer's conductor," and he was sensitive to both the score's drama and its comedy. It's a middle-of-the-road interpretation in the best way: neither excessively serious nor too frothy, and it is always stylish. The singers would have been better matched to Klemperer's seriousness; Giulini tries to lighten them up a notch or two, with little success. Wächter's Giovanni is no laughing matter; he's not the life-loving libertine created by Cesare Siepi, for example. It would be hard to find a grander, even haughtier, Elvira than Schwarzkopf. As Anna, the young Sutherland is every inch the classical tragic heroine; grief is stylized and not allowed to affect the grand line of her singing. Even Cappuccilli's Masetto is better-spoken than one would expect from this character. It is left to Taddei to support the comedy, and he does so without any buffo exaggeration at all. Sciutti's slightly vinegary Zerlina provides needed contrast. Alva sings his two arias beautifully, but what else can one do with Don Ottavio? This reissue contains a full libretto, a synopsis, an essay by Richard Osborne, and a few photos. Unless my eyes (and ears) deceive me, it looks like Gottlob Frick is singing the late Commendatore's music through a megaphone, in the manner of Rudy Vallee. The Boris Godunov was recorded in 1962 with producer René Challan; the intention obviously was to replace EMI's monaural version from a decade earlier, also recorded in Paris, and also featuring Boris Christoff in three roles. Few deny that the stereo remake is impressive, but there are many who prefer the 1952 recording, which was conducted by Issay Dobrowen. (This is not available in the United States, but you can get the CDs through a number of foreign retailers, under EMI Références 5 65192 2). Overall, Dobrowen's cast is better, and the atmosphere he creates is more claustrophobic. Cluytens, on the other hand, gives listeners a more panoramic view, relishing the public spectacle as well as the private terror of this opera. Some critics have found Cluytens's conducting less taut than Dobrowen's, a view I share. Both sets obviously highlight Bulgarian basso Boris Christoff's hat trick of singing three roles. Dramatically or psychologically, there is no reason for doing this; one is forced to conclude that Christoff, unhappy with being "merely" Boris, coveted the music of Pimen and Varlaam as well. True, Christoff finds a different voice for each of these characters, but even so…. The situation becomes dire in the last scene, where Pimen tells Boris about the miracle at the Cathedral at Uglich; in essence, Christoff talks to himself in this scene. You'll have to decide for yourself whether or not you find this ridiculous. Having written this, I must concede that Christoff has a fabulous voice and that his acting – two sizes larger than life – creates an unforgettable impression in all three roles. No Boris of the stereo age can touch him. There are far more similarities between his 1952 and 1962 recordings than differences. Much of the rest of the 1962 cast – and also the chorus – was brought in from behind the Iron Curtain. Some of their singing, while to the manner born, seems slightly provincial to me. Apart from Christoff, the performances are competent but only rarely memorable. One exception is Evelyn Lear's Marina, a triumph for this under-recorded American singer. (On the earlier recording, this role is sung quite well by Eugenia Zareska, but unfortunately, Zareska also takes on Boris's son Feodor – an even more astonishing feat than Christoff's, and equally indefensible!) Ouzounov's Grigory is not nearly as attractive as Nicolai Gedda's, and Diakov's Rangoni yields to Kim Borg's far more persuasive portrayal. Still, there are some reasons to prefer the 1962 recording. One is the stereophonic sound – still primitive, but an improvement over 1952. Also, Cluytens opens a large cut in the first Pimen-Grigory scene – Richard Osborne's notes indicate that Christoff didn't even know about this music until he prepared for this new recording. These factors alone might tip the balance toward Cluytens for some prospective buyers. We didn't get a perfect Boris in either 1952 or 1962. This is as much Rimsky-Korsakov's Boris as Mussorgsky's, and I think the opera should end with the Simpleton's lament, not with the death of Boris, as happens here. 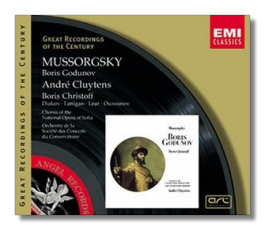 Never mind: both recordings are valid, and it is a pleasure to see Cluytens/Christoff appear at mid-price.